When a prepaid card is reloadable, it generally is meant for longer-term use. Funds initially are deposited on the card and the card can be reloaded with more money at any time. It is the “reload” feature that distinguishes prepaid cards from gift cards. Consumers even may choose to have a paycheck direct deposited to a prepaid card. Prepaid cards usually have a credit card company logo on them but they are not credit cards. You are using your own money instead of borrowing it and paying it back; credit is not used! It looks like a credit card and spends like a debit card, but a prepaid card is in a class by itself. To use a prepaid card, money first is deposited on the card, then it is used to make purchases until the money runs out. When a prepaid card is reloadable, it generally is meant for longer-term use. Funds initially are deposited on the card and the card can be reloaded with more money at any time. It is the “reload” feature that distinguishes prepaid cards from gift cards. Consumers even may choose to have a paycheck direct deposited to a prepaid card. We will be covering the reloadable prepaid cards in this publication. Typically, the reloadable prepaid cards will be associated with one of the major credit card companies (Visa, American Express, MasterCard, Discover) and allow the user to make purchases anywhere the credit card company is accepted. 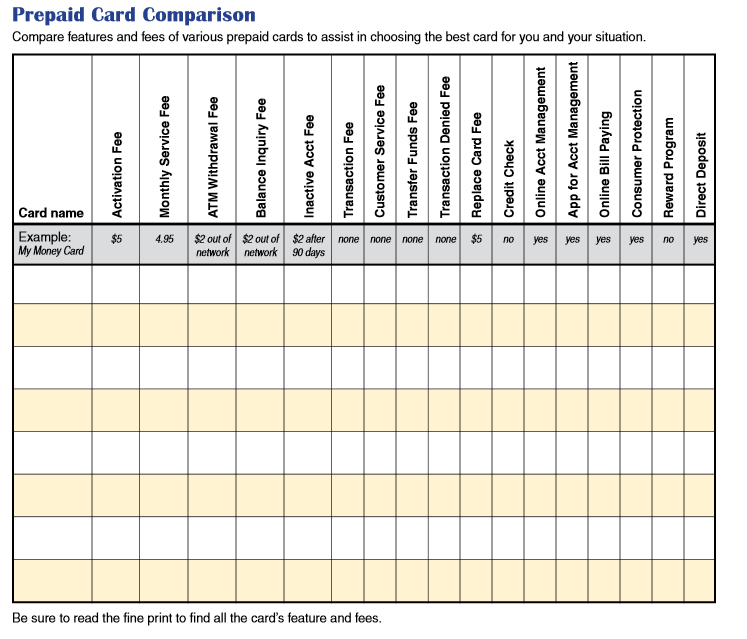 Generally, the individual can spend only the amount that he or she “prepaid” on the card. Reloadable prepaid cards allow consumers without credit cards or bank accounts to have the convenience of paying with plastic. 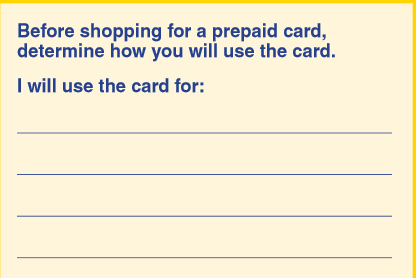 Prepaid cards have pros and cons. Being aware of both can help consumers decide if a prepaid card will work for them and their situation. • The prepaid cards can be safer than cash. If the card is registered with an issuer and it’s lost, you can recover your full balance. • Prepaid cards are convenient. They work much like a bank debit card in that you generally can use them anywhere credit/debit cards are accepted. • Credit checks are not required to get a prepaid card. Plus, using a prepaid card does not impact your credit history. • Prepaid cards are widely available in stores and online. • Cards can be used for online shopping. • Most prepaid cards do not allow you to spend more money than what you prepaid, making overdrafts less of a worry; however, checking the terms on your card is important because some do have overdraft capability and associated fees. • Prepaid cards can be used to receive government benefits (for example, the Direct Express debit card used for Social Security payments) or an income tax refund from the IRS. • Wages may be placed on a prepaid card in place of a paycheck with some employers. • Prepaid cards can be used internationally. • Prepaid cards are loaded with fees that need to be taken into account when choosing a card. • Prepaid cards cannot help you establish or build a good credit history. • Prepaid cards are a fairly new financial tool, and government regulations and protections for consumers still are being developed. Prepaid Cards Will Have Fees! Reloadable prepaid cards tend to have a lot of fees that subtract from the amount of money loaded on the card. These fees can add up quickly and need to be factored in when deciding if a prepaid card will work for you and your situation. While most cards will not have all of these fees, each card will have fees, so shopping around is important for a consumer to get the best card with the lowest fees. The fee schedule is not always displayed well, so dig into the fine print to find the fee structure before purchasing. Below are the most common charges associated with prepaid cards. Some fees may be waived if the holder sets up a direct deposit. Remember, most cards will not have all of these fees, but being aware of all the possibilities is important for a consumer. • ATM or cash withdrawal fee: charged for using the card to get cash at an ATM; some ATM machines also charge a fee on top of the card fee. Some cards do have free withdrawals at participating ATM locations. • Monthly maintenance fees: a common fee that can vary depending on the card. This fee can be upwards of $10 a month just for having an activated card. Even though the prepaid card carries an expense, the reloadable prepaid card may be the best tool for consumers to manage their money in certain situations. Let’s explore some possible examples for using a reloadable prepaid card. • A consumer without a bank could use a prepaid card much like a checking account, deposit pay checks in the card, use the ATM to get cash and pay bills in person or online. • A card could be used by someone who does not qualify for a credit card but still wants the convenience of paying with plastic. • Someone going on vacation may use a prepaid card instead of carrying cash. • Parents may find a prepaid card a good tool for sending money with their college student away at school. They even could load money on the card at regular intervals. • Consumers may find a prepaid card a useful way to shop online. • Prepaid cards may assist in controlling spending; when the money is gone, the card no longer may be used. • A taxpayer may choose to have his or her tax refund placed on a prepaid card provided by the government as an alternative to direct deposit. Prepaid cards can be purchased online, at a local business, through a credit card company, and through a bank or credit union, to name a few options. Some prepaid cards, such as payroll cards or government benefit cards, are provided to you by your employer or a government agency. While you can buy a prepaid card at many grocery stores and other retailers, you likely won’t get the very best deal. Ideally, you should research your options online before deciding on a card. A number of card comparison websites can make the process quicker and easier. For any card you’re considering, visit the card’s website and read the disclosures carefully. You have many prepaid cards to choose from, each with its own benefits and costs. Some cards are more consumer-friendly than others, with fewer and lower fees while still offering many useful features. • Do you travel outside the U.S. frequently? Then choose a card with a low (or no) foreign currency conversion fee. • Do you plan to make ATM cash withdrawals frequently? Look for a card that offers access to a network of free or low-cost ATMs. • Do you plan to use the card only occasionally? If so, watch out for inactivity and dormancy fees. • Will the card be accepted in the places you plan to use it? • Does it have a minimum balance or minimum reload requirement? • Is reloading easy and convenient? • Does it have a daily spending or cash withdrawal limit? • Are network ATMs conveniently located? • Does the card have an online or telephone bill payment system? • What protections are provided? • What happens if you don’t use the card for an extended period? • What kind of budgeting and monitoring tools are available? • Can you earn rewards for purchases or reloads? Some consumers purchase prepaid cards for use by a teen, college student or an elderly parent but want to be able to load funds easily and perhaps even monitor the account. Look for a card that provides transaction or low-funds alerts and allows you to enable and disable ATM access, suspend and reactivate the card, or authorize and reject certain types of online purchases. If you plan to make regular reloads (an allowance, for example), confirm that the card allows automatic reloads. Prepaid cards are a fairly new financial tool, and government regulations and protections for consumers still are being developed. Check the level of fraud protections offered with the prepaid card. In other words, what will happen if it is lost or stolen? For example, payroll cards are subject to certain federal requirements and protection against fraud, but not all cards are subject to these federal protections. Some cards may offer protections through the card company, but you have to complete certain steps to receive those protections. For instance, you may have to register your card in the protection plan and/or report the fraud within a certain amount of time to be reimbursed for fraudulent charges. Some may have a limit on the amount that can be reimbursed. Treat your prepaid card like cash; protect yourself from fraud or theft. Also, be very careful about accepting offers to purchase a prepaid card for less than the face value (or how much it is worth). This could be an indication that the card is stolen. Checking your card when you first get it is important to make sure that none of the protective stickers have been tampered with or removed. In addition, review your monthly statement right away to make sure everything is correct and that you have not been a victim of fraud. Be Aware of Personal Data Collection Inquiries. Consumers should be aware that some gift or prepaid card providers are attempting to collect personal data, including checking and savings account information. These companies say they need the information to collect certain “application and processing fees” from consumer’s bank accounts. If your prepaid card is not attached to a checking or savings account, you should not provide checking or savings account information when you are purchasing a prepaid card. Protect yourself! Like any account you have, reloadable cards require that you monitor your account. This will prevent being charged for unnecessary services. Some prepaid cards allow online monitoring if you are registered with their system. Some companies provide an app to place on your smartphone or tablet, making managing your card easier. Prepaid cards are becoming more popular with consumers and are just one more money tool available to assist in managing money. In some situations, they can be a very useful tool. But they come with added expense and some risk. If and when you find a prepaid card is right for you, do your research and find the best card for your situation. Consumer Action, Prepaid Cards. Nonprofit educational purposes. We work closely with nonprofit and community organizations to ensure that our information has a broad reach. Nonprofit and community-based organizations may freely display, distribute and reproduce Consumer Action publications for noncommercial purposes only if they provide proper attribution to Consumer Action. Attribution must state: Source: Consumer Action. All rights reserved.